One of the country’s hottest high-tech startup communities sits at the base of the Rocky Mountains and world class rock climbing and hiking trails. For entrepreneurs, Boulder, Co. almost has it all – a concentration of national research labs, energy and high-tech companies and lots of outdoor recreation, sustainable living industries and film festivals. 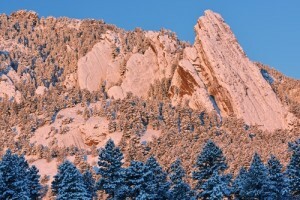 Techies often refer to Boulder as the “Silicon Flatirons,” for the iron-shaped rock formations southwest of the city. Boulder is not only the birthplace of TechStars, a startup accelerator that offers seed-stage investment services for technology-oriented companies, but also startups like SurveyGizmo and Webroot. Its progressive nature and emphasis on natural foods and sustainability is reflected in other companies founded there, such as Crocs, The IZZE Beverage Co., Celestial Seasonings, Horizon Organic Dairy, Sounds True and FlexJobs. Two years ago, the Ewing Marion Kauffman Foundation identified Boulder as the country’s top metro area for technology startups per capita. That same year, Google recognized Boulder as a digital capital of America. Best known for its science and aerospace industries, Boulder is home to the Mesa Laboratory of the National Center for Atmospheric Research that opened in 1967 and Ball Aerospace & Technologies, which arrived about a decade earlier. IBM is Boulder’s largest employer, providing about 2,800 jobs there. At $72,554, Boulder has some of the highest median household income for a town of its size. But that’s offset by sky-high real estate prices resulting from the protected green space around the city that was established to prevent urban sprawl. A median single family home costs roughly $431,200, compared to a national average of $181,400. Home to the University of Colorado’s main campus and a great deal of physicists, engineers, and biotechnology researchers, Boulder also has a high college attainment level of 58.5 percent. Boulder area entrepreneurs can find startup support from the Silicon Flatirons Center at the University of Colorado, which focuses on software, telecommunications and Internet startup communities, and the Innovation Center of the Rockies, a non-profit incubator with specialized teams of mentors and advisers in the areas of clean technology, engineering, bioscience, IT/software, aerospace, and natural and organic foods. While co-working space is tight, it is available at Impact Hub Boulder, Fuse at the Riverside, and Colab Boulder. If you’d like to have a presence in the Boulder, Colorado area for your business, you can seem more approachable by selecting a local phone number with the 303 or 720 area code. With Halloo you can route calls to your employees anywhere. Get your local phone number today! This entry was posted in Local phone numbers, Small Business by Caren. Bookmark the permalink.